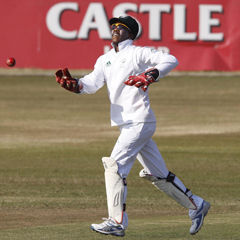 Cape Town - Proteas back-up wicketkeeper Thami Tsolekile says he was "disturbed" after a remark from former Test bowler Makhaya Ntini flared up racial tensions. Ntini, a former Proteas star, raised eyebrows a few weeks ago when he claimed Tsolekile "would be playing for the Proteas if he was white". But Tsolekile, currently playing second fiddle to AB de Villiers on the Australia tour, says on current form he wouldn't include himself in the South African Test XI. "AB is keeping very well - he kept well in England in difficult conditions and I can't see a reason to change the team," Tsolekile told the Herald Sun website. "He is batting well, too. He has made starts all the time, but just hasn't gone on to make the big scores yet. But he will. "If he wasn't getting in, then maybe it would be different, but he's playing well." The 32-year-old Tsolekile, who played three Tests for the Proteas in 2004, admitted he was left puzzled by Ntini's statement. "I played most of my early cricket in the township and obviously, growing up, Makhaya was my icon," he said. "He has done very, very well for South African cricket and played for 12 or 13 years. He is a hero. "But what he said was quite disturbing, for me personally. I wouldn't know why he said that. "I haven't been involved for eight years, I've come back from the wilderness so to speak, but this set-up at the moment is amazing, it is a great group. "Makhaya was speaking on behalf of himself, not me. I haven't experienced anything like that. Maybe he has his own reasons for saying that, but I haven't seen or experienced anything different in this set-up. "The atmosphere has been great and I am very comfortable after all the hard work has been recognised." The second match of the three-Test series between South Africa and Australia starts in Adelaide on Thursday. The first Test in Brisbane ended in a draw.